Enchiladas are a Mexican and Tex-Mex favourite, and these make-ahead vegan enchiladas are really tasty. You can make them ahead if you want, then keep them in the fridge for up to 3 days or the freezer for up to 3 months, or else simply go ahead and cook them if you're ready to eat them today. For the filling we're using sweet potatoes, onion, mushrooms, red peppers and black beans, along with rice, plus cumin and chilli powder for authentic flavour. Feel free to adjust the quantities of spices if you prefer it milder or spicier. These make-ahead vegan enchiladas are healthy as well as delicious, and you might like to serve them with a simple oil and vinegar-dressed green salad. These are vegan (and of course vegetarian) and offer plenty in the way of flavour and appeal. We like to garnish the finished enchiladas with sliced black olives on top. If you're going to make a batch and freeze them, you can freeze them in separate portions. Just make sure you use tightly covered freezer-proof containers and let the enchiladas thaw overnight before you cook them. They will take about half an hour to cook. Just check they are piping hot in the middle before serving. Any leftovers will keep for 3 days in the fridge and you can reheat them in the oven or microwave. 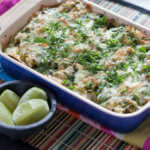 Enchiladas are known for having a lot of cheese, but instead of using vegan cheese here, we are relying on the vegetables and spices for plenty of flavour. If you like vegan cheese you can of course put some on top before baking, but otherwise just make this make-ahead vegan enchiladas recipe as it is. The sweet potatoes offer a nice soft texture which contrasts with the crunch of the tortillas. Peel and dice the potatoes into 1¼ cm (½ inch cubes). Toss the sweet potatoes in half the coconut oil. Spread them out on a baking sheet. Now heat the rest of the coconut oil in a skillet. Add the mushrooms and onion. Now you can add the cumin and chilli powder. Add the bell peppers, corn, rice and black beans. Heat through for 5 minutes, then take off the heat. Pour the enchilada sauce into a 22 x 22 cm (9 x 9 inch) or similar size dish. Dip a tortilla into the sauce then lay it in a 33 x 22 cm (13 x 9 inch) casserole dish. Put about 1/3 cup (80ml) of the filling in the middle of the tortilla then roll it up. Push across to the edge of the casserole dish. Repeat with the rest of the tortillas and rest of the sauce. Pour the rest of the enchilada sauce on top of them. 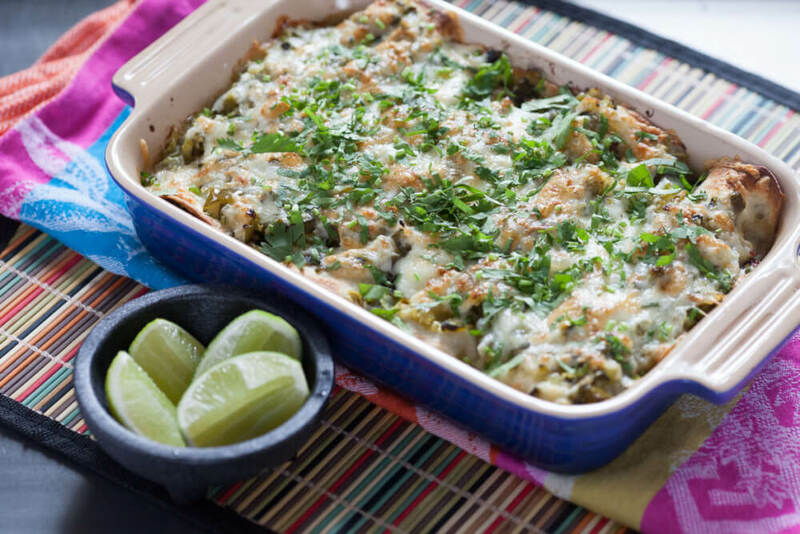 Now you can either put the enchiladas in the fridge (for up to 3 days) or freezer (cover it tightly first) for up to 3 months. Else just continue with the recipe. If you're freezing them, thaw them overnight then proceed with the recipe. Bake the enchiladas at 180 degrees C (355 degrees F) for 30 minutes.